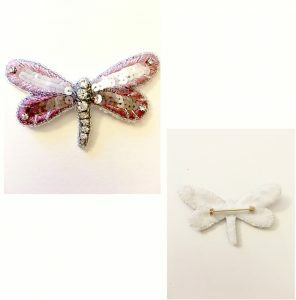 I decided to choose my Maison Lesage embroidery outcome as my favored object to further elaborate themes of myself. When I view this dragonfly pin, I see all of the hours that went into it, including the joy and the struggle. It was truly a time that I pursued my interests to further my education and focus. I gained an enormous appreciation for the craft and quality it requires. Plus, I also see this as hopeful, because I see the desire to learn more and become better. Literally, this object provides a physical representation of my admiration for quality and artisanal crafts. I enjoy the decoration and eliteness embroidery provides. However, after comparing my object to the rest of my representational imagery (collages, photography, and illustrations), I find that this object is merely a technique I enjoy than a representation of a personal theme. Therefore, I have disregarded further investigating subjects related to this object, and will pursue a different topic to research for the remaining semester.